Kelli Nina Perkins: Doughnuts Finis! 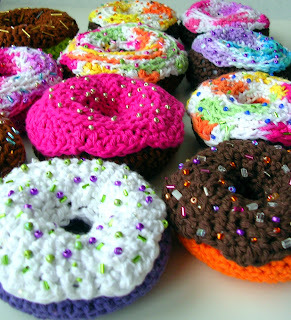 I finished these crazy crocheted doughnuts. There is something about making a dozen of something that feels complete. Generally I like to make at least three of a thing to really get the feel of it--but tradition requires a dozen when the subject is faux baked goods. Breakfast anyone? I love these donuts...too cute. Is there a pattern available somewhere? This pattern is from Lion Brand www.lionbrand.com and it's called Amigurumi Frosted Doughnut. You have to register for their site but they have lots of fun crochet patterns.